Budget hotels, motels and serviced apartments in Perth and the surrounding suburbs at cheap rates is what Budget Stay in known for offering. By booking your online accommodation through budgetstay.com.au you will not only be able to deal directly with these Perth hotels and apartments but will also have the confidence of knowing that you're getting the cheapest discount rates for Perth accommodation. The Mountway Holiday Apartments in Perth provide budget fully self contained studio apartments accommodation in the heart of Perth. Located adjacent to the Swan River, the Mountway Holiday Apartments, Perth CBD accommodation provides fully self contained studio apartments accommodation only a short walk to the Perth city centre and a 4 minute walk to the Perth Convention Exhibition Centre. The Mountway Holiday Apartments provides easy access to all of the major business and tourist attractions in Perth, which is what makes it the perfect self contained apartment accommodation for your next stay in the CBD. The property also features numerous guest services and facilites such as direct internet access, free car parking, guest laundry, bbq facilities and 24 hour reception. For a long time business and leisure travellers have been staying at the Mountway Holiday Apartments because of its unique homely feeling. The Pensione Hotel is situated in the heart of the Perth city centre only a short walk from all the shopping malls, city attractions and the free central area transit bus system. With a great, central location close to everything that Perth has to offer the Pensione Hotel Perth is a popular accommodation for travellers of any budget. This Perth property features a wide range of accommodation and facilities like lounge bar, business centre, direct internet access, faxing facilities, guest laundry, lift, restaurant, room service, tour desk, 24 hour reception, baby cots available for families and daily housekeeping, which makes it a popular place to stay with all types of travellers. The Pensione Hotel Perth is situated within close proximity to the many of the major attractions around Perth including main shopping precinct and the vibrant city centre, restaurants, nightlife scene, Kings Park, WACA, Barrack Street Jetty and the Swan River. The Goodearth Hotel provides guests with a choose of fully serviced apartment style budget accommodation in East Perth that is ideally positioned on Adelaide Terrace. The Goodearth Hotel is ideal for families, groups, holiday makers, corporate and business guests and is only a leisurely stroll from the magnificent Swan River and minutes from the Burswood Casino, shopping, entertainment and nightlife. Ideally situated in a great city location the Goodearth Hotel is within easy reach of all the major attractions that Perth has to offer. This along with the many guest facilities like lounge bar, direct internet access, disabled facilities, faxing facilities, free car parking, guest laundry, lift, restaurant, secretarial services, tour desk, 24 hour reception, daily housekeeping and beauty salon is what makes the Goodearth Hotel such a great place for a relaxing stay. Conveniently situated just a short distance from the Goodearth Hotel are lots of popular destinations, as well as interesting things to see and do. With a range of 1 and 2 bedroom self-contained apartments the City Stay Apartment Hotel perth is ideal for both short and long term stays. The next time that you visit Perth make City Stay your home away from home because of its fabulous central perth location and its friendly staff. Combining a range of resort style accommodation in West Perth, friendly service and a great location the City Stay Apartment Hotel is the perfect place to stay for a business trip or holiday. This budget property also has lots of great facilities including faxing facilities, free car parking, guest laundry, gymnasium & fitness equipment, lift, room service, spa, outdoor swimming pool, tour desk, bbq facilities, atm facilities and baby cots available for families. For a long time business and leisure travellers have been staying at the City Stay Apartment Hotel because of its unique home away from home feeling and close proximity to the sunset coast. Also the friendly and knowledgeable staff and excellent array of facilities at these Perth CBD apartments will ensure that your stay in the city is completely trouble free. The Marque Hotel Perth offers 3.5 star non smoking, affordable, modern & comfortable hotel accommodation located in the heart of the Perth CBD with many of Perth's attractions on your doorstep including shopping & restaurants. No matter the reson for you travel, business or leisure, the Rendezvous Studio Hotel Perth Central provides discount accommodation in a great Perth CBD location. It also features a wide range of modern services such as bar area, conference centre, free car parking, gymnasium, lift, restaurant, room service, tour desk, 24 hour reception and daily housekeeping. The City Waters Perth offers 3 star budget studios & 2 bedroom apartments in the heart of the Perth CBD.Ideal for business or leisure, The City Waters Perth Serviced Apartments are superbly located overlooking Langley Park and the Swan River. 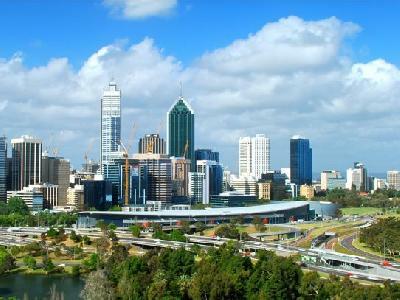 The City Waters Perth is well located in Perth CBD, meaning that it is close to everything that the city has to offer. As well as this the property also has numerous guests facilities and services including direct internet access, guest laundry, tour desk and airport shuttle. The Murray Street Lodge Hotel is a friendly and welcoming 30 room hotel centrally located in West Perth. The hotel is situated opposite Princess Margaret Hospital and close to the businesses and medical practices of West Perth and Subiaco. Staying at the Murray Street Lodge Hotel Perth in Perth allows you to make the most of the many guest facilities at this affordable property, including the bar area, direct internet access, free car parking, guest laundry, restaurant, room service, outdoor swimming pool and daily housekeeping. The Indian Ocean Hotel Perth is perfectly positioned in the seaside Perth suburb of Scarborough. With great nightlife and plenty of restaurants, cafes, bars and nightclubs nearby this affodable Perth accommodation is ideal for your next stay in Western Australia. With easy access to all of the major tourist attractions in the Perth region the Indian Ocean Hotel is the ideal place for your next budget accommodation. It also features numerous guest services and facilities including lounge bar, disabled facilities, faxing facilities, free car parking, guest laundry, lift, restaurant, room service, spa, outdoor swimming pool, tour desk, bbq, atm facilities, 24 hour reception, babysitting service and daily housekeeping. Ideally positioned only a short distance from the Indian Ocean Hotel are lots of popular destinations, as well as interesting things to see and do such as Hillary's Boat Harbour, day trips to Rottnest Island, Kings Park, Swan Valley and Fremantle. The newly refurbished Metro Hotel is an ideal budget South Perth accommodation choice for value conscious business and leisure visitors to Perth wanting affordable, spacious accommodation. Ideally situated in a great city location the Metro Hotel Perth is within easy reach of all the major attractions that Perth has to offer. This along with the many guest facilities like lounge bar, business centre, conference centre, direct internet access, faxing facilities, free car parking, guest laundry, lift, restaurant, room service, spa, outdoor swimming pool, tour desk, bbq facilities, 24 hour reception and daily housekeeping is what makes the Metro Hotel Perth such a great place for a relaxing stay. For a long time business and leisure travellers have been staying at the Metro Hotel Perth because of its unique home away from home feeling. Also the friendly and knowledgeable staff and excellent array of facilities at this hotel will ensure that your stay in Perth is completely hassle free. The Perth Ambassador Hotel is a great place for corporate and leisure traveller looking for great value for money. The Perth Ambassador Hotel is a budget hotel, that is prominently located on Adelaide Terrace. With easy access to all of the major tourist attractions in the Perth region the Perth Ambassador Hotel is the ideal place for your next budget accommodation. It also features numerous guest services and facilities including lounge bar, business centre, direct internet access, disabled facilities, faxing facilities, guest laundry, gymnasium & fitness equipment, lift, restaurant, sauna, secretarial services, tour desk, 24 hour reception and daily housekeeping. With convenient access to everything around Perth due to its central location the Perth Ambassador Hotel offers travellers a range of hotel accommodation that is near public transport, Perth's shopping and entertainment district, the Perth airport, Gloucester Park and the casino in Burswood. Positioned in the heart of the Perth CBD the Kings Perth Hotel is a hotel offering a unique combination of convenience, comfort and value-for-money accommodation. With a great, central location close to everything that Perth has to offer the Kings Perth Hotel is a popular accommodation for travellers of any budget. This Perth property features a wide range of accommodation and facilities like lounge bar, business centre, conference centre, direct internet access, faxing facilities, guest laundry, lift, restaurant, room service, outdoor swimming pool, tour desk, airport shuttle, security, 24 hour reception, baby cots available for families and daily housekeeping, which makes it a popular place to stay with all travellers. all. This budget property provides business and leisure guests with fully self contained apartments close to Northbridge that are spacious and well equipped, as well as great hotel facilities that add to your accommodation experience.